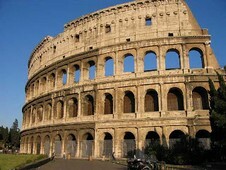 The touristic travel to Rome is an adventure connected with the penetration into the ancient history of the European civilization. The capital of Italy is an amazing European city, which has every reason to become the most favorite holiday destination. The splendor of peach and almond trees, local shopping peculiarities during the time of bargains galore and huge discounts cannot leave indifferent any travelling soul. Of course, this list cannot be complete without visiting the sites, monuments and sincere admiring architectural masterpieces of the city. The bustling life of the Italian capital cannot leave indifferent the fans of festivals and various entertainments. Having hired a car right in the airport of Rome, it is possible to start your acquaintance with the city under the comfortable conditions of driving a motor vehicle. The Capitol, the Forum, the Pantheon, the Colosseum, the Spanish Steps, the St. Peter’s Square, the Sistine Chapel are the historically significant places of the world culture that are worth visiting. After booking a car at the bookingcar.ru web-site, you can expand the area of acquaintance with the country and take a drive on a leased car in Italy to Pisa, Venice, Palermo, Naples, Verona or any city according to your choice. Travelling along the Italian roads is quite comfortable, while all the trunk highways have the hard-surface pavement. The total length of the trunk highways amounts to 6700 km, the net of motorways is about 815254 km. In Rome, there is a practice of penalty payment acceptation by the police officers right in place. In case of such payment method the penalty sum will be minimal, which is the one forth part of the maximum. The obligatory condition of cooperation with the police is a receipt issuing during the payment performance. Serious traffic rules violations committed during the night time increase the penalty sum threefold. The Rome traffic regulations provide for the driving with the speed of 130 km/h. However, when determining the speed rate in favor of the offender, there is applicable a 5% margin of error. Taking into account the 5% margin of error, the speed limit exceeding up to 10 km/h, equals from 137 km/h to 147 km/h. Parking (Parcheggio) in Rome does not differ too much from other parking zones in Italy. If leaving your car in the center of the city, you should clearly define the limits, which are currently in effect in the parking zone. Such limits depend on time of the day, day of the week, and the day evenness. Even an unintentional breach is included into the system of penalties imposing. The yellow line defines a special parking zone for people with physical disabilities and drivers of the delivering cars. According to the traffic regulations, an insignificant blood alcohol content level is permissible. It equals to 0,5% for the drivers over the age of 21 and with the driving experience for more than 3 years. The penalty sum, driver’s license deprivation term or imprisonment term depend on these limits. The traffic rules in Rome regulate the interrelations between all traffic participants on different sections of the road. Restrictions for the cell phone talks while driving. A wide net of the fuel filling stations has been implemented for the convenience of car driving along the trunk highways of Italy. While starting the journey, you should remember that the fuel filling stations are closed for several hours during the day in the small Italian towns. The current type of working mode is displayed on the board Aperto (opened) or Chiuso (closed). The fuel filling stations located along the trunk highways work 24 hours per day. Fuel prices at such filling stations are 10-20 eurocents higher than at the fuel filling stations located near the trading centers. The motorways net in Italy is fee-based. If you are going to start your trip on a car hired in Rome, you should remember about the timely toll payments assigned for passing through the motorways, as well as the traffic costs for passing through some tunnels. The toll rates for the motorways are fixed. The difference in cost ranges from 2 EUR (Naples – Salerno) to 52.20 (Milan – Naples). In order to calculate the payment cost of driving through a motorway on a rented car in Rome, you should take the toll unit and multiply it by the individually covered distance in kilometers. It is also important to add 20% of VAT to the calculated sum. When performing the payment by a selected method, the amount should be rounded to the nearest tenth (0.10 Euros). Type of the motorways net section – mountain or plain.